Rats with wings, anyone? Although pigeons are many-colored, rather pretty birds which are quite intelligent, many people dislike them. There are many species of pigeons, and they are found all over the world. Although pigeons lay only two eggs at a time, they often have five or more nests, each with two eggs, each season. 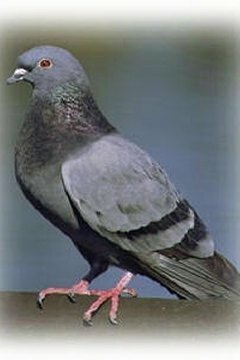 Pigeons annoy many people and are incredibly hard for humans to catch as they can fly up to 50 miles an hour. They also have a homing instinct, and if you're trying to get rid of them, they just keep right on coming back, making catching them a regular responsibility. Set up the trap. As pigeons are fast, it's up to them to come to you. That means you need to trick them. In an area where you frequently see pigeons, sprinkle corn. After several days of this, the pigeons will be accustomed to receiving corn in that location and to seeing you. Now, you need to set up the trap and sprinkle corn or some other food they want to eat in the area around it, leading up to it and in it. Check the trap. When you go back to check on the pigeons, if none of them walked into the trap, go back and let it alone until they do–don't sprinkle more food, just let them go in it themselves to get it. When you do catch the pigeon, you can bring it somewhere and release it–preferably far away if you want to move them–or use it for pet training purposes. If you plan to keep it, be prepared to take care of it. Stand very still. Much like with the cage, spread corn or crackers or something else the pigeons want to eat around you and stand very still. Let the pigeons get accustomed to your presence. Grab a pigeon. When the pigeons are close to you and not paying attention–so excited are they by the food you've dropped for them–reach out and grab one. Voila, your very own pigeon. From here, I suggest you put it in a cage if you're planning on moving it far.